Our first Sulzbacher success story features our Career Education Program. The focus of the Career Education Program is to provide job training and enrichment classes to our residents. The program offers different job training classes throughout the year that range in topics from a class in customer service and basic computer skills to a training on how to become a security guard. Our goal is to build partnerships with companies that are leaders in their field and to have that company’s experts teach the classes. The second round of Security Training classes just concluded in mid-March. There were 21 students enrolled the class and out of those twenty-one, twenty recruits completed and passed the class. Last week, all twenty graduates were shuttled to the Department of Agriculture for their testing. After anxiously awaiting their results, it was no surprise to find out, that all twenty graduates passed the exam and received their licenses. With their new found self confidence and license, these twenty graduates are hitting the ground running and actively seeking employment. We recently received good news from one of the first Security Training class graduates! . Michael graduated at the end of October in 2013 and started his job the following month. Within five months he was promoted and given a raise. This is an example of why this class is so great to have. The security field has plenty of opportunities and room for growth, potentially leading to careers in corrections. This partnership is crucial to the success of the graduates, because First Coast Security is well connected in the Jacksonville Community and prepares our graduates for passing their exam and providing them with contacts and opportunities. Not to mention, security training is their forte! Welcome to the brand new Sulzbacher Center blog! We are launching this blog to share success stories, good news, and updates about the Sulzbacher Center. For the first blog post, let’s have a crash course on the Sulzbacher Center. For those of you that are familiar with the Center, this will be a refresher and for those of you that are not, this will provide you with the basics. 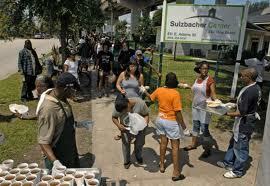 The Sulzbacher Center is the largest provider of direct services to the homeless in Northeast Florida. We opened in 1995 as a collaborative effort of the City of Jacksonville, United Way, and a group of downtown businessmen/philanthropists. Each night over 340 men, women, and children stay at the Center. The average length of stay is 90 days.We are theonly shelter that does not ever charge a fee to stay in shelter. The shelter consists of a family dorm, single women’s dorm, single man’s dorm, and a specialized veteran’s dorm. We also have a program dedicated to enriching the lives of the 80 children that live at the Center. Our children’s program offers tutoring, early child development, boy scouts and girl scouts, and various activities for the children, such as art projects. Our clinic is one of only two Federally Qualified Healthcare Centers in Jacksonville. There is a clinic downtown and one at Jacksonville Beach. Each of these clinics offers medical, dental, behavioral health, substance abuse, and optical services to our residents and uninsured individuals. In addition to the Clinic, the Center also has a Medical Respite Unit. The Medical Respite Unit consists of 28 beds. The purpose of the Medical Respite Unit is to offer medical care to homeless individuals who are too ill or frail to recover from a physical illness or injury on the streets but are not ill enough to be hospitalized. Once they have recovered, the individual can be linked other services the Center has to offer. Also, The Center has five mobile outreach teams. One in downtown , one at the Beaches, one Veteran Outreach Unit for Duval, and two Veteran Outreach Units in Nassau County. Our kitchen serves 1,200-1,500 meals per day, 7 days a week, and 365 days a year. We serve breakfast to our residents and lunch and dinner to our residents and anyone in the community that is hungry. Volunteers from more than 100 civic, religious and business organizations prepared and served over 488,000 last fiscal year, which is an increase of over 57,000 of meals compared to the year before. The Center operates three HUD-funded supportive housing programs: Homeward Bound, Homeward Bound Expansion, and SEA-CHAM. These programs provide rent assistance and places clients in scattered-site apartments. Clients are also paired with a supportive living coach to provide one-on-one case management to ensure the clients are maintaining their apartment, have access to health care and links clients to resources as needed. These three programs have a total capacity of 77 apartments for homeless persons with physical or mental disabilities, substance abuse issues, and/or HIV/AIDS. From 2012-2013, 563 residents were placed in stable housing. The Center offers aftercare case management to families and single women moving into homes of their own. Our Aftercare Program provides the assistance of a case manager for up to18 months after people transition back into the community. This program helps to ensure that their new-found stability is maintained. By continuing to provide our wrap around services once a woman or family has moved out, 95% of people in our aftercare program are still in stable housing after 18 months. As always, check out our website for more information!